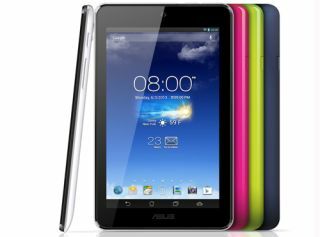 Asus Memo Pad HD7 is ultra-affordable 7in tablet | What Hi-Fi? The Android tablet price war looks set to continue following the release of the Asus Memo Pad HD7, set to go on sale for just $129 (8GB), making it one of the cheapest Android tablets around. There's no word on a UK release date or price as yet but having seen previous Asus tablets make their way over to the UK, we'd imagine it's only a matter of time. Powered by a low-power Cortex-A7 quad-core processor, the Asus Memo Pad HD7 has a 7-inch screen with a resolution of 1280 x 800 pixels. There's a 1.2-megapixel front camera and a 5-megapixel rear camera, Bluetooth support and stereo speakers. The HD7 weighs in at 302 grams and is just 10.8mm thick. This new tablet comes as tablet-makers have been dropping the prices of Android products, with tablets such as the Versus TouchPad 10.1 following the lead of the Google Nexus 7 (which is built bu Asus) and Amazon Kindle Fire HD, in dipping under £200. Asus have also introduced a new version of the Transformer Pad Infinity, a 10.1 inch tablet. The Infinity comes with Android 4.2.2 and has a quad-core Tegra 4 chip, including a Cortex-A15 CPU and 72 graphics cores – making it only the second tablet based on the Tegra 4 chip. With a 2560 x 1600 pixel display, it comes with a higher resolution than Apple’s latest iPad and the same resolution as Google’s Nexus 10 tablet. Asus announced the release of the company's latest tablet at the Computex trade show in Taiwan.